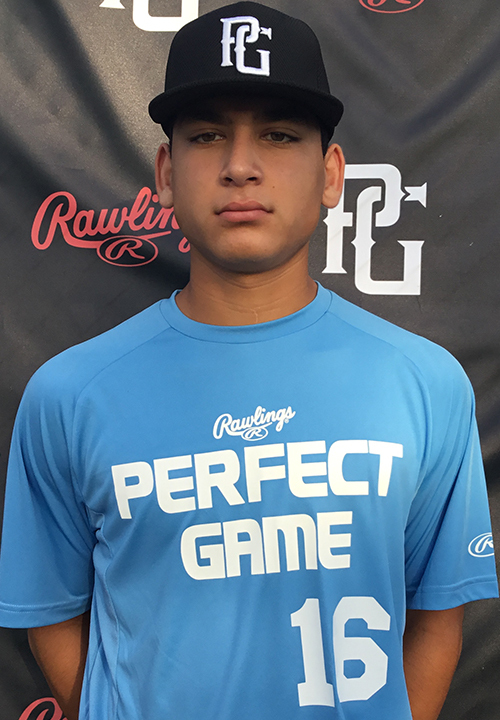 Rylan Galvan is a 2022 C/SS with a 5-10 160 lb. frame from Sinton, TX who attends Sinton. Athletic frame with broad shoulders and strength in build. Projects well for future strength. Ran a 7.12 second 60-yard dash. Worked out defensively as a primary catcher. Extremely quick actions behind the plate. Sets up in a narrow side straddle stance. Stays low through transfer and has big time explosiveness coming out. A lot of arm strength in throws with a bit of reach back to arm circle topping out at 80 miles per hour and popping a 1.96. Also worked out from the infield. Athletic to the ball fielding out front with clean actions to funnel. Smooth and quick arm action with whip to it on throws topping out at 82 miles per hour. Righthanded hitter set up in an even stance with a clean linear shift into contact. Utilizes a short lift trigger for timing. Shows bat speed to contact with a middle of the field approach. Consistently stays on the ball with a lot of barrel contact. Named to the 2018 14U National Showcase Top Prospect List. Also selected for the 2018 14U PG Select Baseball Festival.